So Carefully Consider this . . .
Are the programs consistent and progressive from level to level? Many dance schools have a teacher for the pre-school students, a different teacher for the beginners, intermediate, and advanced students. With the inconsistency of different teachers from year to year it becomes difficult for the dancers to prepare to advance to the next level. Beth Fowler believes that there must be consistency through all the dance levels, beginning thru professional. This is why she herself teaches at least one class of every level from the 3-year olds all the way thru the professional levels. She has other teachers for some of the beginning classes that are not only trained in the programs but progressed through them themselves when they were younger. This assures the programs consistency and the dancer’s ability to progress from level to level. 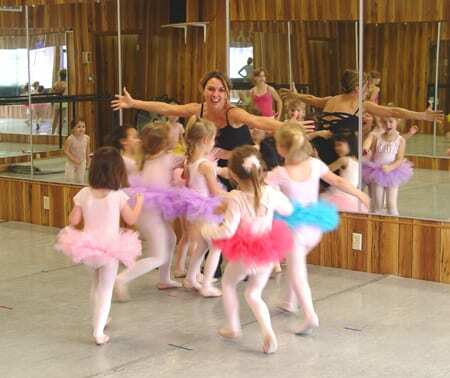 Once the students reach the advanced level, Mrs. Fowler then also provides the dancers with guest teachers and college professors of dance as well, so that the advanced students can experience other teachers once they have developed excellent technique. This is the time to give the dancers more diversity. Dance is a very physical activity that requires a lot of jumping, which can put stress on bones and joints. The best way to prevent against potential injury is by choosing a studio with a professional “floating floor”. A floating floor is a dance floor that rests on a system of high-density foam, to absorb the shock of jumping. A high density foam base is superior to a “sprung” floor, which usually consists of a wood structure built on the regular floor. The top layer of the dance floor is also an important factor. A vinyl composite “Marley” floor is accepted worldwide as the best surface layer for recreational to professional dance. Very few studios use professional Marley floors because of the expense, and usually opt for a regular floor tile. Both of our studios have floating floors that have over 700 high density foam blocks under the floor surface and a Marley top surface that is imported from England. Our special floors help reduce the risk of injuries and allow students to dance longer without getting tired. Because of our professional floating floor and excellent stretching program, our school has one of the lowest injury rates. Have you ever heard this statement? “Only eat at a restaurant that looks busy, because it is a sign of good food”. That concept applies to dance classes. Have you ever seen a class with only 4 or 5 students and asked why? If you asked to see their waiting list for that class do you think they would have one. Our classes are so popular, and our enrollment is large enough that we are able to divide our students by age, so that only one age is present per class. We don’t just have one class but two classes for each age group. With only one age present the dancers are given age appropriate material, which helps them to progress faster. There is a big difference between a 3 year old and a 4 year old. Another benefit of having two classes of every age is the convenience of an appropriate “make-up” class. If your 4 year old missed their class on Tuesday, she/he can always make it up in the other 4 year old class on Saturday for example. For personalized attention we have multiple teachers and teacher assistants in each class. We only take the first 18 students into a beginning level class. This gives our classes a student/teacher ratio of at least 1 teacher to every 6 students or better. Students beyond 18 will be put onto a waiting list. Any teacher should admit that bigger classes are faster moving, cover more material, and have so much more energy. Many times small classes have little energy, are slower moving, and sometimes result in socializing. Here is what a dance parent had to say about our classes and class sizes. What are the “extras” required for performing in the shows? Most dance schools require the parents to purchase the costumes and take care of any alterations. Many times there are additional fees for rehearsals outside class, and additional fees for master classes working with guest teachers and choreographers. The Beth Fowler School of Dance owns and provides all costumes, and props for the three performances per year. For some dancers there will be rehearsals outside of class. There is never any charge for rehearsals, nor is there any charge for master classes with guest teachers and choreographers. In many studios the teacher or studio owner conducts classes and does the administration. By trying to do two jobs at once, the class may suffer as the teacher has to use class time for customer service issues, or the studio may not have any customer service available at all if the teacher is in a class. To have a good experience it is important to choose a studio that can assist you with all the details and questions you might have even if the teacher is in a class. At the Beth Fowler School of Dance you can always have immediate assistance as our trained office staff is always on hand during all our regular class times, as well as other times during the week. Find out why we are the largest dance school in the area even though we are located in the smallest city, and why hundreds of families choose to commute to our dance school in Genoa each year. Our teachers have professional backgrounds. Our teachers are chosen not only for their qualifications but for their ability to connect and relate to the typical needs of our students. We offer our dancers “dance packages” which include a variety of different dance classes at a “multiple classes” discount. These classes are offered back to back all in one day, providing more time for other activities and less driving for the family. With two beautiful dance rooms, siblings can have class at the same time or on the same day. Because our large school enrollment allows us to have two classes of every age, there are always two classes at every age level to choose from. The other class makes a convenient make-up class to catch students up if they missed a class. Knowledgeable, helpful desk staff is available to assist you during all classes as well as other times 6 to 7 days a week. Our organized staff will give out many informative hand-outs throughout the year and will even take the time to highlight each individual schedule or letter to what pertains to that individual. We strive to provide good service to avoid confusion and so that dance is a hassle free and enjoyable experience. Our family discounts, and multiple classes discounts, are set up so that the more hours a family takes, the less it is per class. With this system, dancers can benefit from taking a full class in each dance form (Ballet, Jazz, Hip Hop, Tap etc.) at an affordable rate.